Very unusually we have had no snow on the mountains at all this year so far. This bodes ill because very mild dreich winters tend to lead to midge infestations in summer the following year. But today for only the second time this year it was below freezing and there was quite a bit of snow on Beinn Bheula. Please let the road be ok tomorrow as I absolutely need to go and get my hair cut. 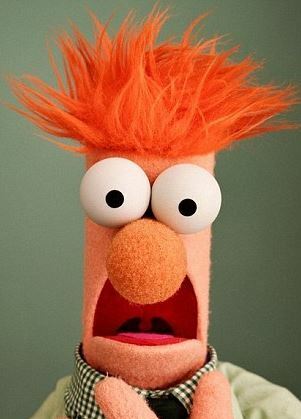 I have started to look like Beaker because having a shower last thing at night makes my hair stand right on end the next morning if it doesn’t get cut regularly. It is a terrible shame that we no longer have a hairdresser in the village as it was really convenient just going down into the village rather then spending most of the day going to Helensburgh.